Root exudates are chemical compounds that are released from living plant roots and provide significant energy, carbon, nitrogen and phosphorus sources for microbes inhabiting the rhizosphere. The exudates shape the microflora associated with the plant, as well as influences the plant health and productivity. Therefore, a better understanding of the trophic link that is established between the plant and the associated bacteria is necessary. In this study, a comprehensive survey on the utilization of grapevine and rootstock related organic acids were conducted on a vineyard soil isolate which is Pseudomonas mendocina strain S5.2. Phenotype microarray analysis has demonstrated that this strain can utilize several organic acids including lactic acid, succinic acid, malic acid, citric acid and fumaric acid as sole growth substrates. Complete genome analysis using single molecule real-time technology revealed that the genome consists of a 5,120,146 bp circular chromosome and a 252,328 bp megaplasmid. A series of genetic determinants associated with the carbon utilization signature of the strain were subsequently identified in the chromosome. Of note, the coexistence of genes encoding several iron–sulfur cluster independent isoenzymes in the genome indicated the importance of these enzymes in the events of iron deficiency. Synteny and comparative analysis have also unraveled the unique features of d-lactate dehydrogenase of strain S5.2 in the study. Collective information of this work has provided insights on the metabolic role of this strain in vineyard soil rhizosphere. Root exudates are rhizodeposits that are released from living plant roots into the surrounding rhizosphere (Uren 2007). These compounds mainly consisted of water-soluble sugars, organic acids, and amino acids, providing significant energy sources for microbes inhabiting the rhizosphere and its vicinity (Brimecombe et al. 2001). This represents a form of plant–microbe interaction that enables colonization and development of active microbial populations in plant roots and the surrounding soil (Bais et al. 2006; Haichar et al. 2008; Nihorimbere et al. 2011). Although the nature of exudates varies according to growth stages of a given plant, the composition of root exudates is also influenced by environmental factors such as pH, temperature, availability of nutrients, and presence of microorganisms (Nihorimbere et al. 2011; Singh and Mukerji 2006). Furthermore, the differences in exudation profiles directly impact the composition of the microflora inhabiting the specific niche that the rhizosphere is (Singh and Mukerji 2006; Mondy et al. 2014). The exudates shape the microflora associated with the plant, and further influences plant health and productivity, hence a better understanding of the trophic link that is established between the plant and the associated bacteria is necessary. Grapevine (Vitis vinifera L.) is a non-climacteric fruit crop that grows as deep-rooted perennial plant (Archana et al. 2011). Pseudomonas spp. namely Pseudomonas fluorescens, P. lini, P. mendocina, P. putida, and P. syringae were among the soil inhabitants commonly found at both the acidic and alkaline soils of these native grapevines (Chan et al. 2016; Chenier et al. 2008; Chong et al. 2012, 2016; Karagöz et al. 2012). Our previous investigation on microbiota inhabiting the vineyard soil in Riquewihr, France has led to the isolation of P. mendocina strain S5.2 that harbor resistance traits towards various heavy metals (Chong et al. 2012). In this study, a further elucidation of utilization of grapevine related compounds was conducted to gain insight on the intricate interaction occurring between the strain and the grapevine. Our work aimed at inclusively determining the phenotypic and genomic profiles associated with grapevine exudate utilization. With reference to the collective reports of various organic acids detected from grapevine and rootstock related exudates, a gene-trait matching approach followed by a comparative analysis was employed to unravel the complete profile of genetic determinants associated with the displayed utilization of the carbon compounds by this strain. 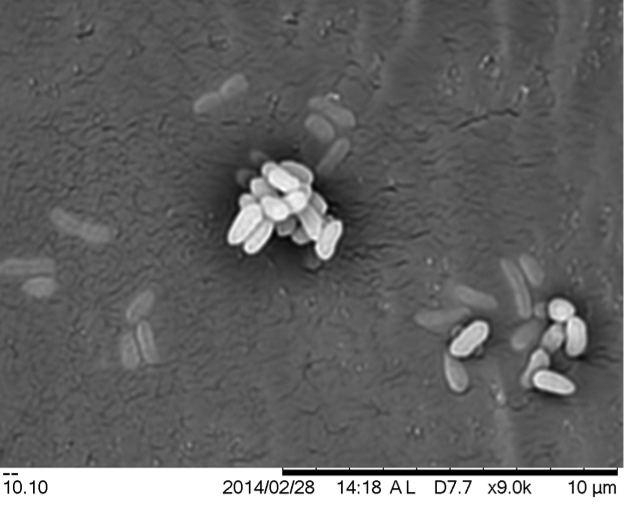 Pseudomonas mendocina strain S5.2 was isolated from a vineyard soil in Riquewihr, in the Alsace region of France. Isolation of this strain was performed using KG minimal medium as previously described (Chong et al. 2016). Routine maintenance of the culture was performed on Luria–Bertani (LB) (Merck, NJ, USA) medium at 28 °C. Identification of the strain was conducted via 16S rRNA gene sequencing followed by phylogenetic analysis and pairwise similarity analysis using EzBioCloud database (http://www.ezbiocloud.net/identify) (Kim et al. 2012). Phylogenetic analysis was performed using molecular evolutionary genetic analysis (MEGA) version 6.06 (Tamura et al. 2013) with the list of hits from EzBioCloud 16S rRNA database. Scanning electron microscopy (SEM) observation of strain S5.2 was performed with osmium tetroxide fixing and ethanol dehydration procedures followed by viewing using a SEM TM3030 (Hitachi, Japan) device in accordance to Lau et al. (2014) with minor modification. The carbon utilization profile of strain S5.2 was assessed using the 96-well PM1 and PM2A plates (Biolog, USA). In brief, the overnight cultured bacterial colonies were inoculated into IF-0a GN/GP base inoculating fluid (Biolog, USA) to reach 85% transmittance (T) according to the manufacturer’s protocol. Aliquots (100 µl) of cell suspension and 1× Biolog redox dye mix A were inoculated into each well of the plates respectively, followed by incubation at 28 °C. The utilization and growth of 192 different carbon substrates from the plates were monitored for 48 h with readings taken at 15 min intervals. The kinetic information was recorded and quantified using OmniLog OL_FM_12 kinetic software (Biolog, USA) followed by data analysis (Bochner et al. 2001). In the event of bacterial growth, photographic readings of colour intensity resulted in dye reduction were represented in OmniLog units (OU) (Khatri et al. 2013). The threshold for positive bacterial growth was established at 100 OU, calculated with the subtraction of maximum growth value with the first reading (0 h). Genomic DNA of P. mendocina S5.2 was purified using MasterPure DNA Purification Kit (Epicentre, Illumina Inc., Madison, Wisconsin, USA) followed by purity measurement and quantification using NanoDrop 2000™ spectrophotometer (Thermo Scientific, MA, USA) and Qubit 2.0® fluorometer (Life Technologies, MA, USA), respectively. Sequencing library was prepared from purified genomic DNA according to the guidelines of Template Preparation Kit (Pacific Biosciences, Inc., CA) with library size targeted at 20 kb. Sequence collection was then carried out in 2 SMRT cells using P6/C4 chemistry on a PacBio RS II platform (See-Too et al. 2016). De novo assembly of the long reads was performed using the Hierarchical Genome Assembly Process (HGAP) version 2.0 using the PacBio SMRT portal. Gepard dotplot program (Krumsiek et al. 2007) was employed to verify the circularity of the resulted contigs followed by circularization of overlapping ends using minimus2 pipeline in AMOS software package (Treangen et al. 2011). Genome annotation was subsequently performed using Rapid Prokaryotic Genome Annotation (PROKKA)(Seemann 2014). Candidate genes potentially involved in the metabolism of carbon sources were validated using the rapid annotation subsystems technology (RAST) server (Aziz et al. 2008) and NCBI prokaryotic genome annotation pipeline (PGAP). Subsequently, MEGA version 6.06 was also employed for multiple sequence alignment of the amino acids. Additionally, pairwise average nucleotide identity (ANI) analysis using strain S5.2 and other relative Pseudomonas spp. was conducted using JSpeciesWS (http://jspecies.ribohost.com/jspeciesws/) with above cutoff more than 95% (Richter et al. 2016). Lastly, the synteny and comparative analysis on the genes of interest were conducted based on SyntTax web server using default parameter followed by manual verification (Oberto 2013). SEM showed that cells of strain S5.2 were 1.5–2.5 µm in length and 0.8–1.0 µm in width (Additional file 1: Figure S1). Pairwise similarity analysis on EzBioCloud database followed by phylogenetic analysis using complete nucleotide sequences of 16S rRNA showed that strain S5.2 was closely related to P. mendocina NBRC 14162T (Additional file 2: Figure S2). This observation was later verified with ANIb analysis (Additional file 3: Table S1). Among the 192 putative carbon sources tested, P. mendocina S5.2 was able to utilize 58 compounds as sole carbon sources. With reference to the grapevine and root exudates related organic acids, positive utilization was detected for l-lactic acid, succinic acid, d-malic acid, l-malic acid, d, l-malic acid, citric acid and fumaric acid, with average OU values at 243 ± 55 and growth value up to 293 with citric acid as sole carbon (Table 1). The inability of the strain to utilize oxalic, sorbic and all enantiomers of tartaric acids with average growth values of 26 ± 7 was also observed (Table 1). The genome of P. mendocina S5.2 contained a ~ 5.12 Mb circular chromosome and a ~ 0.25 Mb megaplasmid that was later designated as pPME5. They were assembled in a single contig each with average coverages of 181.55× and 206.96× obtained for the chromosome and pPME5 plasmid, respectively. The mean G+C content of the chromosome (62.4%) was found to be higher than that of pPME5 (54.7%). Among the 4641 predicted protein coding genes, a total of 3747 (80.7%) could be associated with clear functions. In contrast, only 24 out of 319 (7.5%) open reading frames of pPME5 were predicted to have known functions (Table 2). The collective genomic and phenotypic information in the study has enabled the identification of genes for the specific carbon utilization. The circular chromosome of P. mendocina strain S5.2 was found to harbor a series of orthologous genes and operons associated with utilization traits of grapevine and root related organic acids (Fig. 1; Table 1). For utilization of succinic acid, the sdhCDAB operon encoding succinate dehydrogenase (SDH) complex, a tricarboxylic (TCA) cycle enzyme was identified (Table 3). The reported catalysis of SDH involves the oxidation of succinate to fumarate, coupled with the reduction of ubiquinone to ubiquinol (Ackrell et al. 1992; Westenberg and Guerinot 1999). Besides, an operon associated with lactic acid utilization encoding putative NAD-independent lactate dehydrogenase (iLDH) activity was also present. This enzyme possibly catalyzes the oxidation of lactate to pyruvate, a feature essential for most lactate-utilizing bacteria (Diez-Gonzalez et al. 1995; Gao et al. 2015; Gibello et al. 1999; Goffin et al. 2004). Components of this operon also included a lactate permease (lldP), l-lactate dehydrogenase (lldD) and d-lactate dehydrogenase gene (dld) indicating that strain S5.2 could degrade both lactate enantiomers (Table 3). Adjacent to these genes was lldR that encoded a transcriptional regulator possibly controlling the expression of the above-described genes. Comparative analysis with other Pseudomonas strains showed a high degree of synteny for the lldRPD genes (Fig. 2). Although sharing the identical flavin adenine dinucleotide (FAD)-binding site with all compared strains, sequence similarity search showed that the dld of strain 5.2 was similar only to those of some Pseudomonas spp., Alcaligenes spp., and Deftia spp. strains. The growth of P. mendocina strain S5.2 was observed in the presence of malic acid enantiomers. Two distinctive genes encoding malate dehydrogenase (SfcA) and malate quinone oxidoreductase (MQO) were found (Table 3). These enzymes shared a general activity catalyzing the oxidation of malate to oxaloacetate. SfcA is a cytoplasmic malate dehydrogenase that reversibly oxidizes malate and is a principal enzyme in the TCA cycle that requires nicotinamide adenine dinucleotide (NAD) as an electron acceptor (van der Rest et al. 2000). Alternatively, MQO is FAD-dependent, membrane associated protein that irreversibly oxidizes malate and donates electrons to quinones of the electron transfer chain (Kather et al. 2000). Following the fumaric acid utilization phenotype, the genome also harbored genes encoding two classes of fumarate hydratase, namely FumA and FumC (Table 3). FumA is a class I fumarase that catalyzes the interconversion of fumarate to malate and requires iron–sulfur (Fe–S) cluster as a cofactor (Chenier et al. 2008; Flint et al. 1992). In contrast, FumC does not rely on Fe–S clusters for hydration of fumarate to malate (Chenier et al. 2008; Hassett et al. 1997). Coexistence of the isoenzymes in the genome may permit the strain to better survive under iron deficiency conditions. Genes for aconitate hydratases, AcnA and AcnB were also detected (Table 3) in the genome ensuing the proficient metabolism of citric acid reported above. Acn proteins catalyze the stereospecific isomerization of citrate to isocitrate and require Fe–S as an enzyme cofactor, as does FumA (Beinert and Kennedy 1993; Mailloux et al. 2006). The present work has demonstrated the carbon utilization signature of P. mendocina strain S5.2 in relation with in silico identification of genomic features associated with grapevine organic acid utilization. Tartaric, malic, oxalic, lactic, citric and succinic acids are among the main organic acids detected in grapevines and root exudates across various genotypes (Andersen and Brodbeck 1989; Cançado et al. 2009; Dharmadhikari 1994; Kliewer 1966; Li et al. 2013; López-Rayo et al. 2015; Mato et al. 2007). The illustrated utilization profile of these organic acids by P. mendocina strain S5.2 has provided new insights into the diversity of carbon utilization by P. mendocina. Subsequently, the gene-trait matching approach has demonstrated that these organic acids are catabolic substrates for the strain, involving the concerted actions of enzymes featured in TCA cycle and possibly other metabolic pathways. Such profile may also reflect on the specific nutrient requirements of the strain towards the given niche of the rhizosphere, in which the composition of the deposited exudates was affected by the aforementioned environmental factors (Nihorimbere et al. 2011; Singh and Mukerji 2006). As an update on the previously reported draft genome of P. mendocina strain S5.2, the availability of complete genome sequences has allowed accurate definition of gene coordinates and recognition of paralogous gene families. Of note, the unique feature of DLD gene of strain S5.2 was highlighted in this study through amino acid sequence alignment and phylogenetic analysis. Despite sharing a high degree of synteny and similarity for genes encoding LldR, LldP and LldD, the DLD of strain S5.2 did not group with the putative DLD2/ferrodoxin of most Pseudomonas spp. Instead, the DLD of strain S5.2 shared higher similarity withs DLD of P. alcaliphila and other betaproteobacteria strains (Alcaligenes faecelis and Deftia sp.) (Fig. 2). Essentially, phylogenomic analysis conducted by Gomila and coworkers (2015) showed that P. mendocina and P. alcaliphila were in fact clustered under P. oleovorans group which is closely related to P. aeruginosa group. Hence such differential grouping of DLD even among the closely related groups of Pseudomonas might represent distintive catalytic mechanism required for d-lactate metabolism. On the other hand, the identification of several isoenzymes has indicated differential catabolic preferences in relation with changes in environmental factors. For instance, the identification of Fe–S independent isoenzymes for utilization of malic acid, MQO and fumaric acid, FumC could be an indication of the essentiality of these enzymes during iron deficiency events. In addition, the absence of MQO has been shown to impede utilization of acetate, ethanol and acyclic terpenes in Pseudomonas strains, hence implying the essentiality of MQO in the metabolic versatility of strain S5.2 (Förster-Fromme and Jendrossek 2005; Kretzschmar et al. 2002). Interestingly, strain S5.2 was shown to exhibit some resistance to copper (Chong et al. 2012). It is also possible to relate the carbon utilization profile with heavy metal resistance traits. Indeed, various carbon sources can serve as an effective electron donor for a given metal resistance, as observed with the reduction rate of hexavalent chromium [Cr(VI)] and trivalent iron [Fe(III)] by Cellulomonas sp. ES6 in presence of molasses versus pure sucrose (Field et al. 2013). Also, a combination of various carbon sources was required for chromium reduction by Klebsiella sp. PB6 and by a bacterial consortium in contaminated sediments (Smith et al. 2002; Wani and Omozele 2015). Given the heavy metal resistant traits displayed by Pseudomonas strains in previous studies (Chan et al. 2016; Chong et al. 2012, 2016), the preferences in utilizing the specific carbon compounds for in situ remediation of copper and other metal ions for instance in vineyard environments should be conducted in future research. In conclusion, the present work has demonstrated the carbon utilization signature of P. mendocina strain S5.2, together with in silico identification of genomic features associated with grapevine organic acid utilization. Taken together with the relative cooper resistance identified earlier (Chong et al. 2012), this work demonstrates the remarkable adaptation of P. mendocina strain S5.2 to the grapevine and vineyards environment. Design of the experiments: TMC, JWC, WSST, CG, YD, DF, KGC. Experiments performed by: TMC, JWC, CYY, GYA, YLL. Data analyses: TMC, JWC, WFY, CG, DF, YD, KGC. The article written by: TMC, JWC, WSST, YD, KGC. All authors read and approved the final manuscript. TMC, WSST, YLL, WFY are postgraduate students and officers from University of Malaya whereas CYY and GYA are from Universiti Teknologi MARA and their research work focus on genomic studies and bioinformatics. JWC is a postdoctoral fellow from University of Malaya specializes in phenotype microarray analysis. CG is a research engineer whereas DF and YD are research advisors from Centre National de la Recherche Scientifique (CNRS), France. Their area of expertise includes genomics, plant pathology and microbial ecology. At last, KGC is an Assoc. Prof. in University of Malaya and the director of UM Omics Centre. His area of expertise includes molecular microbiology, bacteriology and genomics studies. KGC, TMC, and YD thank The French Embassy in Malaysia for the awarded fellowships and continuous support of the collaborative effort between the CNRS (Gif) and University of Malaya (KL) laboratories. All the data applied in the study are included in the tables and figures presented. The complete genome sequence has been deposited at NCBI under accession number CP013124 for the chromosome and CP013125 for the pPME5 plasmid. Strain deposition was conducted in German Collection of Microorganisms and Cell Cultures (DSMZ) with the deposition number of DSM102033. This research was supported by the University of Malaya through HIR Grants awarded to KGC (UM-MOHE HIR Grant UM C/625/1/HIR/MOHE/CHAN/14/1, No. H-50001-A000027; UM-MOHE HIR Grant UM C/625/1/HIR/MOHE/CHAN/01, No. A000001-50001). This research was also funded by Postgraduate Research Fund (PPP) (Grant No. PG080-2015B) awarded to TMC. 13568_2017_437_MOESM1_ESM.png Additional file 1: Figure S1. Scanning electron micrograph of P. mendocina strain S5.2. Cells of strain S5.2 measured at the size of 1.5–2.5 µm in length and 0.8–1.0 µm in width. 13568_2017_437_MOESM2_ESM.png Additional file 2: Figure S2. Phylogenetic tree highlighting the positions of P. mendocina strain S5.2 relative to other strains within the Pseudomonas genus. 13568_2017_437_MOESM3_ESM.docx Additional file 3: Table S1. ANIb result (%) generated from JSpeciesWS (http://jspecies.ribohost.com/jspeciesws/) using strain S5.2 and other relative Pseudomonas spp. strains. The green colour indicates above cutoff (>95%).